Only 11 sleeps until Christmas. If today, you bought a dozen Krispy Kreme Doughnuts and ate one per day, your last doughnut would be eaten the day after Christmas. Plus, it would probably make you sick. HEALTH WARNING: Doughnuts should be eaten within two days of the “Hot Light”. Please be careful …….. you know how I worry. One Christmas, a mother, decided she was not going to remind her kids to send thank you notes. Because of that, the kids’ grandmother did not receive any thank notes for the Christmas checks she sent to the kids. The next Christmas, all the grandkids stopped by in person to thank their grandmother for their checks. As it turned out, the wife was pregnant and delivered on Christmas Eve. On Christmas day she brought home a brand new baby sister for their son. Remember: No one will complain because you made them laugh too much. 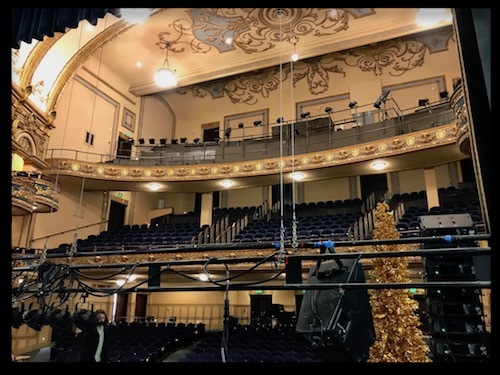 A special “Thank You” to Three on a String, and the Lyric Theater staff, and technical crews for making the Three on a String – Home for Christmas – Laughing All The Way Concert a huge sellout success. Hundreds of hours of planning and preparation went into presenting an event that ran flawlessly. The two-hour concert included “Three on a String”, “Something Else Trio”, “The Warblers”, and “Glenn Strange”. PPS – Your Bonus:A man walked into a doctor’s waiting room and asked if could see the doctor. The receptionist was hesitant to let him in, especially as it was Christmas Eve and she was waiting to turn off the Christmas lights in the waiting room and go home; but he was very insistent. The Doctor, having had completed all his consultations for the day and feeling in a ‘good will to men’ mood, agreed to see him. The man entered in a somewhat aimless manner and after some hesitation flopped into a chair and looked nervously around the room. “Well I’m very sorry, but you’re in the wrong place. What you need is a psychiatrist”. “That’s what I’ve been thinking” replied the man. The man agreed, and the doctor made the appointment. “Well,” the man said in a resigned voice “The door was open, and the lights were on …..”. Only 18 more sleeps until Christmas. Please be careful …….. you know how I worry. “Q” How do you know Santa has to be a man? “A” No woman is going to wear the same outfit year after year. “Q” What did Adam say on the day before Christmas? “Q” What do you have in December that you don’t have in any other month? Just before Christmas, an honest politician, a generous lawyer, and Santa Claus all got into the elevator of the hotel. As the elevator traveled from the 5th floor down to the ground level, they noticed a $100 bill lying on the elevator floor. Which one picked up the $100 bill, and turned it into the hotel receptionist? 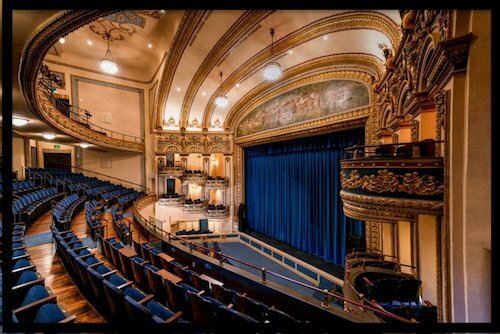 Don’t forget, “Three On a String” will also be at the beautiful “Newberry Opry House” in Newberry, SC, on January 6, 2018. Great music and hilarious comedy. Tickets to this event make great Christmas gifts for your special friends. Tickets fit all sizes. Available now at www.NewberryOperaHouse.com. PPS – Your Bonus:Three weeks before Christmas, little Johnny asked his mother if he could have a new bike. She told him that the best idea would be to write to Santa Claus. But Johnny, having just played a major role in the school nativity play, said he would prefer to write to the baby Jesus. Johnny went to his room and wrote ‘ Dear Jesus, I’ve been a very good boy and would like to have a bike for Christmas.’ But he wasn’t very happy when he read it over. So, he decided to try again, and this time he wrote ‘Dear Jesus, I’m a good boy most of the time and would like a bike for Christmas.’ He read it back and wasn’t happy with that one either. He tried a third version. ‘Dear Jesus, I could be a good boy if I tried hard and especially if I had a new bike.’ He read that one too, but he still wasn’t satisfied. 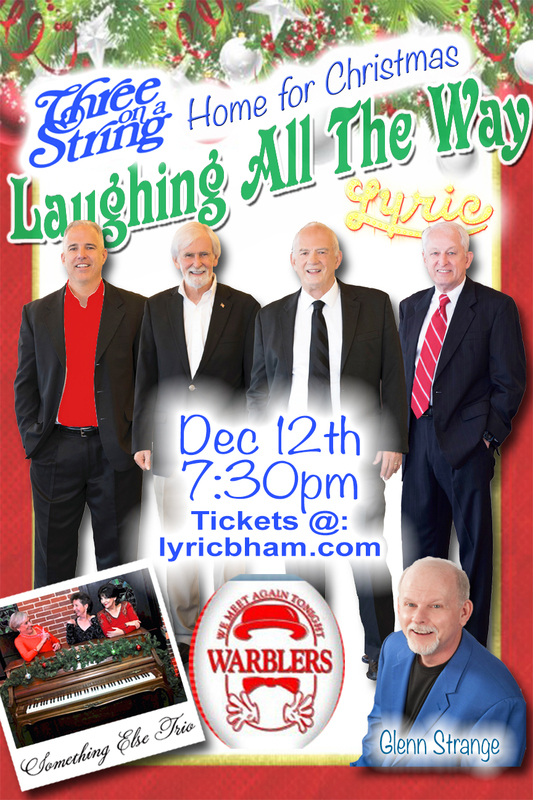 Lyric Theatre, Dec 12, Be There! Christmas a Comin: Only 25 more sleeps. SAFETY DRIVING TIP: It must be a law because people start driving crazy on Black Friday and continue until New Year’s day. Please watch for them …. you know how I worry. 10. Hey! There’s a gift! 9. Now, I have something to wear when I shop at Wal-Mart. 8. If I had not just gained 15 pounds, this would fit perfectly. 6. What an ideal gift, and it’s fireproof. 5. If my dog destroys this, I’ll be furious! 4. I love it — but I fear the jealousy it will inspire. 2. It is true. It is better to give than to receive. 1. You shouldn’t have, I really don’t deserve this. A man bought his wife a beautiful diamond ring for Christmas. Not everyone loves to dance, but everyone loves to laugh. 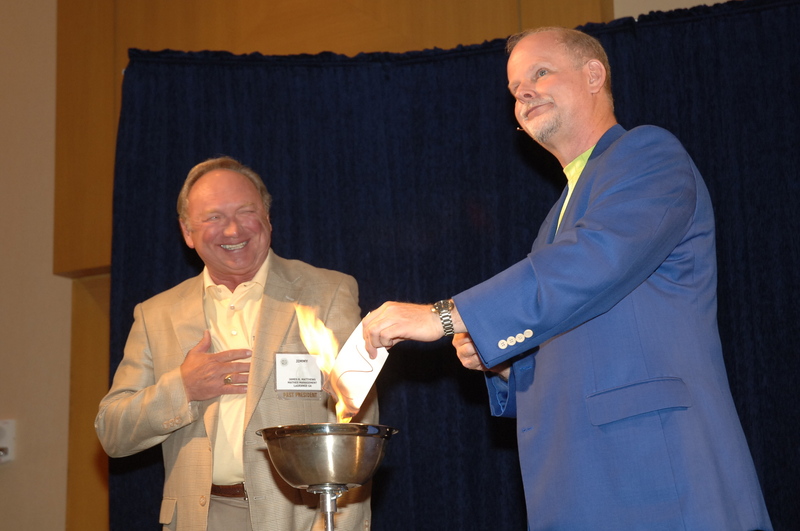 Plan your next special event around Quality Professional Clean Comedy. 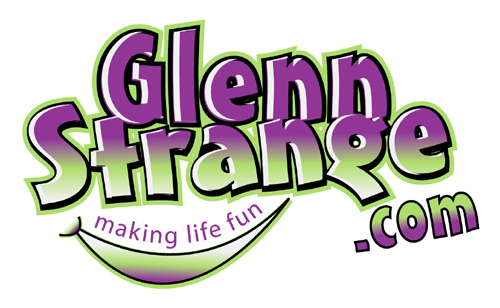 Go to GlennStrange.com and look at the type audiences Glenn’s performed for. PPS – Your Bonus:Sally, a lady about 50 years old walked up and sat on Santa’s lap. ‘Something for my mother, please,’ replied Sally. Well, it’s only the beginning of December and I’ve already had my fill of Hallmark Christmas movies. This year they started airing on November 5. All 22 new versions of the same old plot, with different faces. Everyone’s still whispering their lines, and you can hear soft jingling, tinkling bells in the background all through the entire show. Throughout the movie, you’re pulling for 2 people to realize they’re perfect for each other. Somewhere in the last 5 minutes, they give up, fall in love, the music gets louder, and snow starts falling. THE END. The only difference I see this year is that all the characters have upgraded their mobile phone service, and they’re using smartphones. I’m just waiting to see if one of the characters has a pocket battery explosion. Probably not going to happen, cause that would add excitement, and that’s something no Hallmark movie has ever had. Thanks for listing. Pass me the tissues. Holiday Alert: Only 7 days until Thanksgiving, and 39 sleeps until Christmas. SAFETY DRIVING TIP: Wet leaves covering a road can be slippery when you’re applying your car breaks and/or turning your wheels. Please be careful ….. you know how I do worry. PS – Don’t miss your Thanksgiving BONUS at the very end. 1) Artificial Intelligence usually beats real stupidity. 2) The early bird who catches the worm works for someone who comes in late and owns the worm farm. 3) What is a free gift? Aren’t all gifts free? A police officer pulls over a driver and informs him that he has just won $5,000 in a safety competition, all because he is wearing his seatbelt. “What are you going to do with the prize money?” the officer asks. Bob in Birmingham calls his son in New York just before Thanksgiving and tells him, ‘I am sorry to tell you, but your mother and I are divorcing. I cannot take any more of her moaning and complains. We can’t stand the sight of each other anymore.’ I’m first telling you, Sam, because you’re the eldest, please call your sister in Chicago and gently break it to her. Julie phones here parents and tells them both ‘You must NOT get divorced. Promise you won’t do anything until Sam, and I get over there. We’ll be with you tomorrow. Until then, don’t take any action, please listen to me’, and she hangs up. PS – Don’t miss your BONUS funny at the very end. 1) A woman worries about the future until she gets a husband, while a man never worries about the future until he gets a wife. 2) A man will pay two dollars for a one dollar item he wants. A woman will pay one dollar for a two dollar item that she doesn’t want. 3) A woman marries a man expecting he will change but doesn’t. A man marries a woman expecting that she won’t change and she does. The National Transportation Safety Board recently divulged a highly secret plan they had funded with the US auto makers for the past 5 years. The NTSB secretly funded a project whereby the auto makers were installing black boxes in 4 wheel drive pick-up trucks in an effort to determine, in fatal accidents, the circumstances in the last 15 seconds before the crash. The cop begins to get angry. “Sir, I’m afraid you have to come with me.” The cop reaches in the window to subdue the man. “Don’t do that!” the man yells fearfully. “I’m scared you will find the gun in my glove compartment!” The cop pulls his hand out. “Wait here,” he says. Soon after O’Shaughnessy clocked in for work, the foreman called him over and told him that he had a phone call in the front office. About an hour later, the foreman returned to inform him that there was another phone call for him in the office. This time when O’Shaughnessy returned he looked twice as glum, and the foreman asked if everything was alright. Late one Saturday night, a policeman spotted O’Callaghan driving very erratically through the streets of Dungarvan, County Waterford. The policeman pulled him over and asked him if he had been drinking that evening. ‘Aye, so I have. ‘Tis Saturday, you know, so me and the lads stopped by the pub where I had 6 or 7 pints,’ chattered the inebriated O’Callaghan. ‘Then there was something called “Happy Hour” and they served these mar-gar-itos which are quite good. I had 4 or 5 o’ those. Then I had to drive me friend O’Reilly home and o’ course I had to go in for a couple of Guinness – couldn’t be rude, ye know. Then I stopped on the way home to get another bottle for later …,’ and O’Callaghan fumbled around in his coat until he located his bottle of whiskey, which he held up for inspection. Only 46 sleeps until Christmas. Please enjoy this week’s funnies. Safety Tip: This Christmas, instead of risking a fall and breaking body parts. Do not hang lights around the eve of your house. Just purchase one of those “As Seen On TV”, Star Shower Motion Laser Projector things. You can put one up in less than 10 minutes, and they’re cheaper than hospital bills. PS – Don’t miss your BONUS joke at the very end.Only 46 sleeps until Christmas. Please enjoy this week’s funnies. Safety Tip: This Christmas, instead of risking a fall and breaking body parts. Do not hang lights around the eve of your house. Just purchase one of those “As Seen On TV”, Star Shower Motion Laser Projector things. You can put one up in less than 10 minutes, and they’re cheaper than hospital bills. Please be careful ….. you know how I worry. 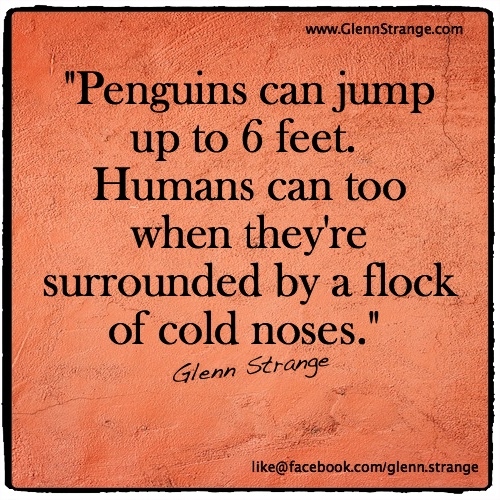 Glenn Strange PS – Don’t miss your BONUS joke at the very end. 1) Stop repeat offenders. Don’t re-elect them! 2). If Barbie is so popular, why do you have to buy her friends? 3). I intend to live forever. So far so good. A priest and a rabbi are in a car crash, and it’s a bad one. Both of their cars are demolished, but amazingly neither one of them is hurt. “And here’s another miracle,” says the rabbi. “My car is destroyed, but this bottle of wine didn’t break. Surely God wants us to drink the wine and celebrate our good fortune,” he says, handing the bottle to the priest. The priest nods in agreement, opens the wine, drinks half of it, and hands it back to the rabbi. The rabbi takes it and puts the cap back on. “Aren’t you going to have any? asks the priest. 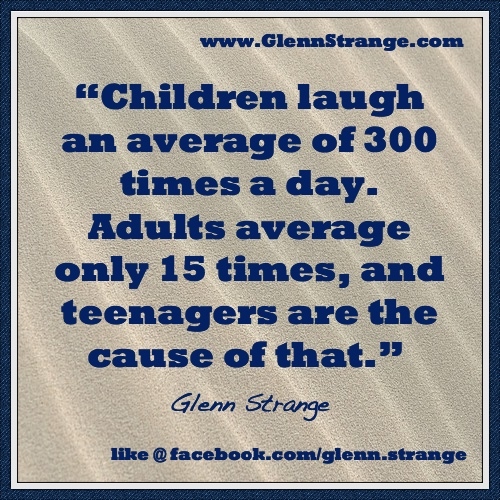 Make someone laugh today. It’ll make you and them happier. Today’s Safety Tip: “Remember, your first mistake can also be your last.” Please be careful on the highways and in old abandoned wells… you know how I worry. PS – Don’t miss this week’s BONUS funny at the very end. 1) Call your dentist office and remind them that you do not have an appointment next week. 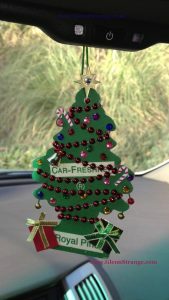 2) Hang a scented air fresheners all over someone’s office door. 3) Place strong magnets inside a McDonald’s bag, locate the bag on the roof of your car and drive around. The teacher was lecturing on map reading. If March had only 30 days, April Fool’s Day would fall on April 2. “Well, just wait a minute,” said Mr. Johnson. “The next question was, ‘Who freed the slaves?’ Mary put Abraham Lincoln, and so did you.” “Well, I read the history book last night, and I remembered that,” said Johnny.